A few days ago, in my post about RBL's then-upcoming sale, KarenD mentioned that Locavore was one of her lemmings, and unfortunately Locavore has now been d/c'd by RBL. I replied that Glow Up Already may be suitable substitute, so I figured I'd do a comparision for anyone wondering if Glow Up Already would kill your Locavore lemmings. Is Glow Up Already a dupe for Locavore? Sadly, no. However, it does hit all of the same notes, just perhaps in a different key. :) They are packed with glitter and have golden-green bases. They both have blue and purple glitter. Locavore is much brighter than Glow Up Already, though. 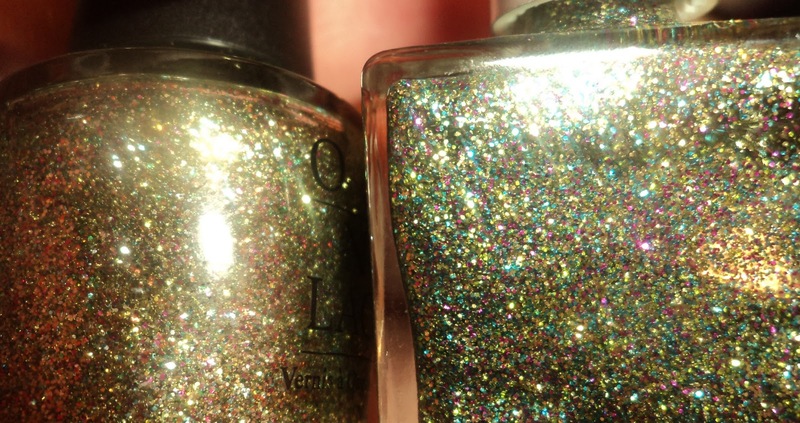 Plus, Glow Up Already has more colors of glitter than Locavore. There's also a brighter green and a red-orange in the mix. Though it takes longer to reach opacity, the OPI is a better formula and is easier to control (hence the Locavore on my cuticles. :S). For my money, I think Glow Up Already is a good substitute considering Locavore is d/c'd. If you were waiting until the big RBL sale to get Locavore and it sold out out from underneath you... 1. you have my luck :P, and 2. Glow Up Already probably won't kill your lemming. It may help to shut it up, though. Ji has mentioned on FB that she is open to bringing back d/c'd colors, if there is enough of a demand. Heck, that's the exact reason she brought back Scrangie and No More War. So if you love Locavore, or any of the other d/c'd RBLs, definitely email Ji to campaign for them to be brought back. PS - I know I have been teasing you for a few weeks, both here and on Twitter, with OPI's Burlesque collection, and I should have the full collection up for you soon. Glow Up Already was sent to me for reveiw. Locavore was purchased by me. Mmmm, Lovacore is beautiful! When the Burlesque collection came out, I hoped this one would be a dupe, but thanks for clearing it up! I'll just have to shell out the big bucks for RBL haha.